Well, we assume whoever runs the international Twitter account for 2K Games has had an interesting Tuesday. 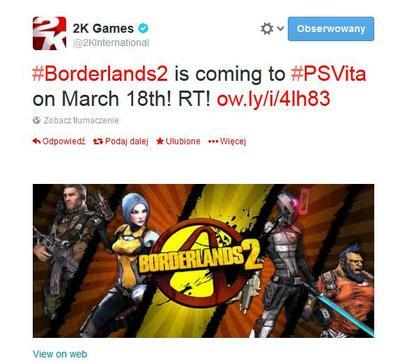 The Windsor, England-based office either unintentionally leaked the March 18 release date for the PS Vita version of Borderlands 2 or completely made up the news earlier today. NeoGAF nabbed a screenshot of the tweet in question, which you can see at the head of this post, and the Twitter account has since had the tweet expunged. In its place are two separate tweets sharing an apology. We’re sorry for any confusion this may have caused. For more info on Borderlands 2 on Vita please follow @playstation & @GearboxSoftware. We’ve known that a PS Vita version of Borderlands 2 is on its way for a while now. In regards to its release date, all we know is that Gearbox and Iron Galaxy Studios, the house working on the port, have 2014 targeted.